Yay Christmas lights! Did you guys also spend who knows how much time driving around in your car on the hunt for epic Christmas lights growing up? Just us? You probably just didn’t have the Pelzer Light People. And so it was with these high standards that I set off in search of epic light displays in DC. We made it a tradition to check out something new each year. 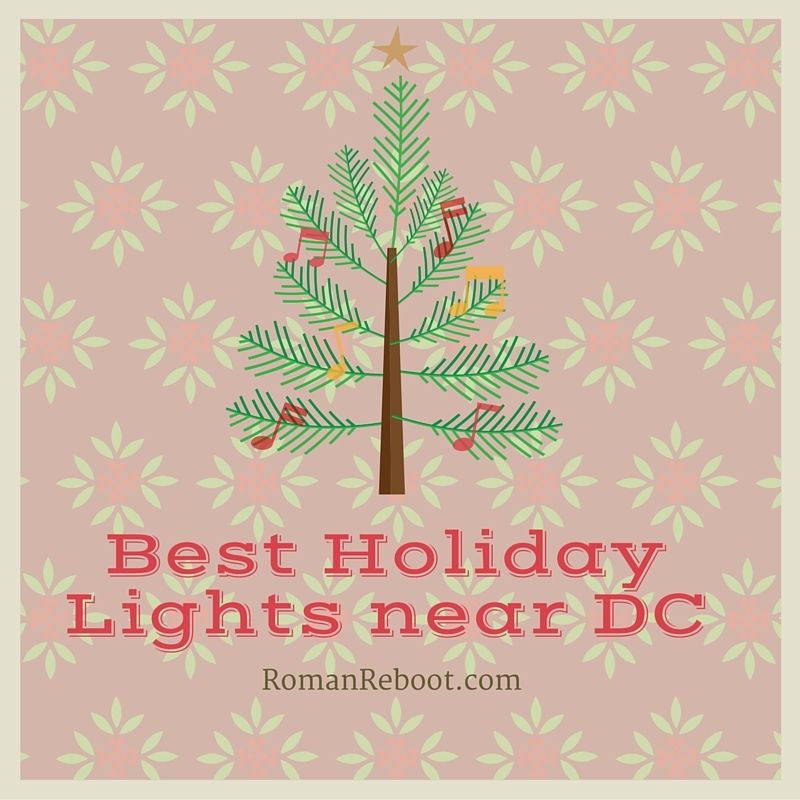 Because the lights in DC are so much more than the Christmas trees at the White House and Capitol! Already hit the zoo and the trains at the Botanic Garden? Don’t feel like shelling out for ICE! at National Harbor? Well, my friend, this list is for you. What is the ONLY thing better than lights on a house? (Or on a person, of course.) Lights on a boat! That’s right, for one magical night you can see a parade of boats boasting intricate light displays floating around the harbor at Annapolis. I know Annapolis is a bit of a trek, but you should try this, at least once. If the weather is cold, you can still see the lights from a second-story window seat at Buddy’s Crabs & Ribs. Or warm up after with the best cream of crab soup of your life at Cafe Normandie. Spotting lights from the window is OK from the front seat, but it can be hard for the kids. With tinted windows and carseats, they sometimes miss out on the action. Here, you can walk (or stroller) through a forest wonderland full of lights. This one isn’t cheap, but it definitely offers a dense light per dollar value. Also, I seem to remember some pretty sweet trains set up in the greenhouse. P.S. If you make the trip out, you could also combine a ride with Santa at the National Capital Trolley Museum. Remember the first time you were driving on the beltway and you’re all, oooo, what is that, when you spot a Disney villain castle come up on the horizon? Ever since discovering this, I really really really wanted to visit the Mormon Temple. When I heard they had lights, I went for this reason alone. To my delight, the lights are quite wonderful. Also, they have a very impressive display of Nativity Scenes from around the world that you can enjoy inside the Visitors’ Center. You don’t get to see much of the Temple itself, but I’d go anyway. We ended up getting an annual membership here because there were just so many fun events. Also, it made a great spot for a Sunday afternoon picnic. Can’t think of what to do today? Let’s hit Hillwood. I liked to swan around pretending I was a part of DC society of yore who possibly lived like this. Yes, step into my drawing room. Please, let’s all adjourn to the ballroom. My delusional hostess fantasies definitely went into overdrive around the holidays though. Picture lots of tasteful and elegant decorations that I do not have in my life. I could blame the children, but we all know the real reason. But let me pretend. You can also check out the Russian Winter Festival this month. Baby Henry sat through his first play, the Snow Maiden, there. Sniff. Those are our faves. What have I missed? Does DC look like a magical wonderland now? I miss it, but I’m definitely enjoying the warmer temps over here!